In the study of Haft Pomrock & Ginath1 the hands of the people suffering on schizophrenia were featured by a chaotic pattern of lines as well. - Table C-6: The number of lines in the schizophrenics and the controls. Finally several research studies indicate that schizophrenia is frequently featured with an extremely LOW number of palmar lines, or: an extremely HIGH number of palmar lines. Table C-6 present some research data presented by Haft-Pomrock & Ginath1. Rather remarkable is that an excess of lines is observed in 40% of the studied people suffering on schizophrenia. An impressive confirmation for these results was recently presented by Cannon2. The hands of 7 out of 46 schizophrenia patients were featured with a 'very high amount of fine lines': see figure C-7. And on top of this observation: NONE of the studied 43 controls had a 'very high amount of fine lines'. By the way, the researchers have rejected the possibility that the high number of fine finger lines in the hands of schizophrenics is primary the result of the use of 'neuroleptics'. Figure C-7: fingerprint of a schizophrenic patient. 1 - Haft-Pomrock, Y. & Ginath, Y. (1982). Differences between schizophrenics and normal controls using chirological (hand) testing. Isr. J. Psychiatry. Relat. Sci., vol.19; no.1, p.5-22. 2 - Cannon, M. et al. (1994). 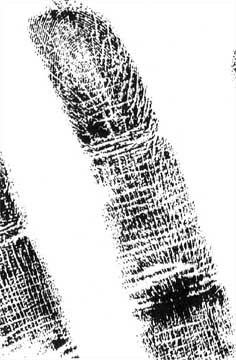 Further evidence of anomalies in the hand-prints of patients with schizophrenia: a study of secondary creases. Schizophrenia Research, 13, p.179-184.